I consider myself a family historian. Genealogy is a tool I use to construct my family stories. For this reason, my family tree does not wander back to the hinterlands of history. Most of the people I research date from the 18th century forward. In fact, until this article, I didn’t even have a category on my blog for the 17th century. Also, DNA research has revealed that illegitimate conceptions may spring from the cellular realm to take me by surprise. That makes my biological family tree look a bit different from the paper-trail one. The further one goes back in time, the more likely a family tree branch is pure fiction. Richard Maxson is currently the oldest known ancestor on my tree (wink, wink). He was born in Manchester, England, in 1602, but I do not have any record supporting that date and place as fact. Richard is the ancestor of two of my 6th great-grandfathers. His son, John, my 9th great-grandfather, has the distinction of being my oldest ancestor born on American soil, in about 1639. Ann was persuaded to move to Portsmouth, Rhode Island. The Maxson family was part of the group that migrated with her. They settled on Aquidneck Island, which was later named Rhode Island.4 It was here that John Maxson became the first white child born on the island. The Maxson family apparently also moved around that time to a nearby location now known as Throgg’s Neck.9 At the time, it was known as Maxson’s Point. The Hutchinsons and Maxsons did not heed a warning by the Indians not to build homes in that area. Google Earth image showing the area the Hutchinsons and Maxsons attempted to settle. Only one of Ann’s daughters, away picking blueberries, escaped the slaughter. Susanna had hidden in a cleft boulder where she was later found and kidnapped by the Indians.10 She was reportedly spared because of her fiery red hair. Horrible. Interesting. Shallops eh? Sounds like Sean Connery saying scallops. Great post again. How interesting Eilene. Clash of cultures gone wrong. I can hear Sean ordering seafood now! Such difficult, yet fascinating times. I admire your ability to find these stories and share them here. 1639?! That makes you so far beyond the DAR criteria that it is crazy. And I love it. Thanks! I build on the work of others. 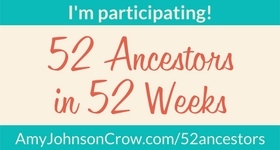 Yeah, I do have a fair number DAR ancestors, but I’m not into joining. I could join, too. I went to one meeting and decided this is not for me. The ladies didn’t seem to mind that I didn’t want to be part of their clique. Go figure? Every time I read something like this, I find myself diving down rabbit holes of history. I hadn’t realized the connection to Anne H until I wrote this. That’s an interesting story, too. You’re looking a bit blue today! I guess the name came from some guy named Throckman or something like that. I guess that’s a well-known bridge, but I don’t think I’ve ever been there. Very interesting! 🙂 It’s amazing about how so many of us are here by a long line of near misses and razor-thin lucky breaks! But if we weren’t, we wouldn’t know! As usual, very well written and documented. However I tend not to agree with your statement: “The further one goes back in time, the more likely a family tree branch is pure fiction.” I have successfully built and documented my father’s line to 1140 and my mother’s to well beyond that. It is true that documentation is harder to find the farther back you go but it is not impossible for the diligent researcher. It is of course somewhat easier if your family (such as my mother’s) is well known in history. My mother’s family (Allen) came to America aboard the Mary and John in 1633. Their history in England before that date is very well documented. I wasn’t referring to a documentation issue, but the fact that biological urges sometimes take precedence over marriage vows. This is quite a story! Love it. It’s amazing how connecting an ancestor to a place makes it more meaningful. It does give me a reason to go exploring!